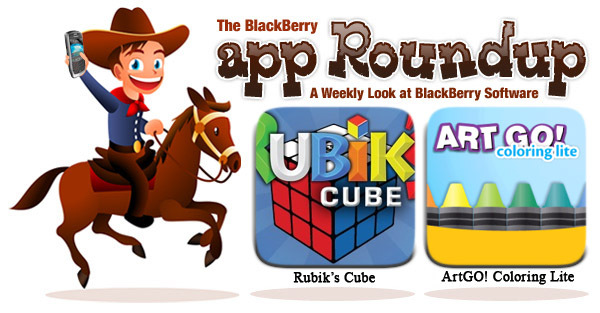 BlackBerry App Roundup for September 17th, 2010! Win 1 of 25 copies of Tether! Howdy and welcome to the weekly app roundup! At the end of last week, we saw Dave Peckens join the CrackBerry Posse; I know he’ll definitely keep his CrackBerry badge polished. On second thought, the whole Crack Team should keep them extra shiny, as we are currently in the countdown to Devcon 2010. Most of the Crack Team will be there to cover it with six shooters-a-firin’! Well maybe not, they might get kicked out. As far as contests go, we have the winners of last weeks Fixmo Tools giveaway. This week, we have 25 copies of Tether for BlackBerry up for grabs! Have a terrific weekend! Giddy up! 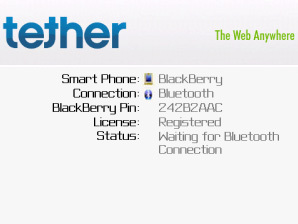 Contest: Enter to win 1 of 25 copies of Tether for BlackBerry! Fono FX -Do you Deal or Transact in Foreign Currencies (Forex)? Does Fluctuations in rates Dent your Profits? Get Latest Forex Exchange Rate updates – Live and always on your Phone! You need FxPro if you or your Business is any of these: Importers, Exporters, Traders, Forex, Banks, Tourists, Business. All Major World Currencies are covered and Forex Rates runs as a Ticker on your Phone Screen. 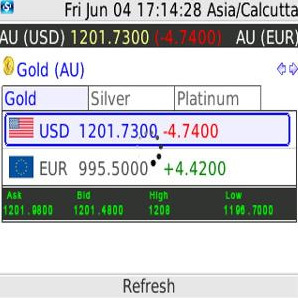 Set High & Low Target Prices for Currencies and get Auto Alerts as soon as Target is Hit! Caller ID Ringtones -Hear the name of the person calling you! 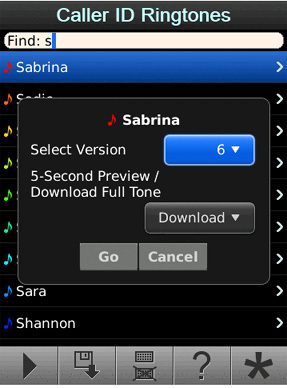 Caller ID Ringtones delivers over one thousand high-quality ringtones directly to your BlackBerry. You can browse a large sample of these unique tones and quickly download your favorites with the touch of a button. Thousands of names to choose from! If you enjoy our sample application, please consider purchasing our full version. It contains over 10x the number of ringtones and offers UNLIMITED downloads. There are separate applications for male and female names. The full versions of each are currently on sale for $2.99 at the CrackBerry App Store. Mobile Recovery -Your phone found. Misplaced your phone? No problem. Use Mobile Recovery's Phone Alarm feature to sound a loud tone from your phone until you are able to locate it. If your phone is outside the audible range, Mobile Recovery can locate your phone on a map and give you turn-by-turn directions to its location. Your privacy secure. If your phone is ever lost, use Mobile Recovery to remotely erase the contacts from your device and lock your phone from use to keep your private information from falling into the wrong hands. This is only available to Verizon customers with TEC (Total Equipment Coverage) on their plan. Rubik’s Cube -Rubik's Cube: The #1 best selling toy of all time, now on your BlackBerry! Play the classic cube anywhere, anytime! Test your skills against the familiar 3x3x3 cube, or tackle other sizes, up to 5x5x5! Haven't figured out how to solve the cube yet? The included solution guide will help! 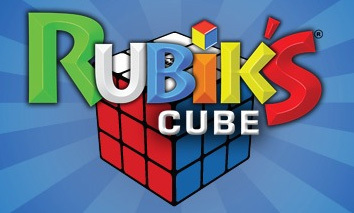 Track your performance as you learn to solve the cube more quickly and in fewer moves! Go global and compare your times with the best in the world! It's all made possible in the only officially licensed Rubik's Cube game! 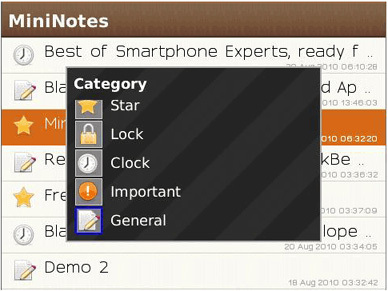 MiniNotes -MiniNotes is a fun and cool replacement for the native MemoPad application. With MiniNotes, you can easily categorize you notes, alter the font to include italics and bold and more. Universal search with OS 6.0 is also supported. The Notes are stored in the SDCard. The text in the Notes can be formated: Font, Color, Size, Bold & Italics. Notes with a image background, we offer 10 different colors. Notes filtered by words in the titles. Custom labels for the categories. Export to a text file. Import of existing memos in the MemoPad application. eWatcher -eWatcher provides two great sections for anyone on a diet. 1. The Diet Food Guide: A full list of foods with their associated points value. This list is always growing and updates are free. 2. 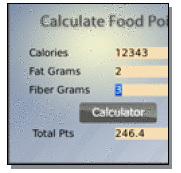 Points Calculator: Use this tool to enter a food's calories, fat grams and fiber to get the total value. The Food Guide is a database of hundreds of foods and popular restaurant and coffee houses. You can easily check for updates to this database at any time and quickly download them with one click! A great reference tool for anyone on a diet! Full Food Guide has hundreds of popular foods and even popular restaurant items. Download free updates to the Diet Guide with one click! 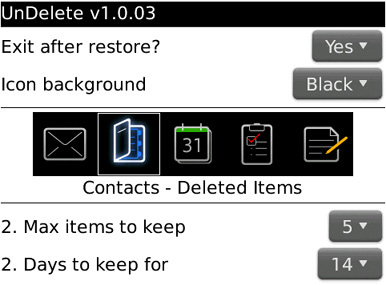 Undelete -UnDelete captures and enables the recovery of deleted items from all of the standard PIM apps (Contacts, Calendar, Tasks, MemoPad) plus Email* & PIN Messages on BlackBerry smartphones running 4.5 OS or above. * Some limitations apply when recovering Emails - refer to help document for more details. Direct access from the “UnDelete” menu option in each of the supported apps. Quick and easy recovery with minimum keystrokes and automatic return to app. Recover back to a different list if available (i.e. multiple Calendars). Separate deleted item folders for each type (Contacts, Calendar, etc) listed by most recent. Control the maximum number of deleted items held at any one time separately for each type. Control the number of days to keep items for separately for each type. Hourly background task maintains folders based on user criteria. Manually delete (permanently) items or empty an entire type’s folder of deleted items. Blaq -There has been quite a buzz surrounding this Twitter application. Many have been waiting for the day this app would be unleashed. Tired of keeping a handful of Twitter apps around on your BlackBerry smartphone just to obtain a faux sense of having it all? We are, too. Never before has a BlackBerry Twitter client truly satisfied the user’s ideal picture of the perfect, well-rounded app — until now. 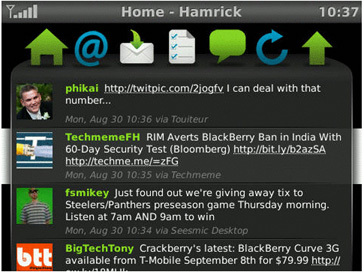 Enter Blaq — a feature-rich Twitter client for BlackBerry that brings the best of all worlds with the functionality you need, but also the stunning visuals that you’ve always yearned for. Download Blaq now and start experiencing Twitter — the way you should be — on your BlackBerry smartphone today. Quick Tweet - launch a Quick Tweet box over whatever you’re currently doing, and post tweets without ever opening the app. ArtGo! Coloring Lite -ArtGO! Coloring Lite turns your BlackBerry® smartphone into a coloring book. Pick up your crayon and go! ArtGO Coloring will make sure you stay inside the lines, so you can just have fun and let your imagination run wild. Or select a blank coloring page and draw whatever you'd like. Set your drawing as your wallpaper, or email it to a friend or relative. The lite version includes a few coloring pages, and a selection of colorful crayons. No full version of ArtGO! is available at this time. ArtGO! Have you ever been stuck in an airport, hotel room, coffee shop, or on the road with no Internet? Frustrated paying $9.95 for 30 minutes of internet service? Resorting to your Blackberry, but wished you could use your laptop? Tether is here to provide a solution to all those worries! Tether is an application that allows your PC to take advantage of your Blackberry's data plan, allowing you to access the Internet on your laptop, anywhere there is cellular coverage, from your BlackBerry. We have 25 copies of Tether for BlackBerry up for grabs! All you have to do is leave a comment to be entered. Winners will be announced next week. Speaking of announcements, here are the winners of the Fixmo Tools contest. Well there you have it folks! I hope you enjoyed the apps we managed to corral this week. If you have any information on software (including news and tips), or if you are developer looking to be in the spotlight (or contest) let me know via email at blundell@crackberry.com or twitter.com/ryanblundell.